Selection of stamp stockbooks ranging from 8 to 32 pages, all these are with black pages, view our other stockbooks page for white page stockbooks. Also: Luxury Lighthouse linen hinged and cased stockbooks, plus a great range of collector accessories! Stock-books can also be used for other types of collectables, however they are especially ideal for the long term conservation, storage, display and transportation of stamp collections. We only supply 'Heavy Items' such as these stock-books within the UK. 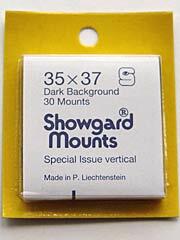 Black Padded binder and double linen hinged pages plus protective page edge strips. Comprises 288 strips to position stamps into. Includes a matching leatherette hard slip case to protect the stockbook. Superb Gift! Padded Dark Green binder and double linen hinged pages plus protective page edge strips. Comprises 288 strips to position stamps into. 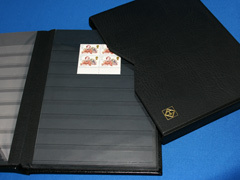 Includes a matching leatherette hard slip case to protect the stockbook (black cover version illustrated). Superb Gift! Padded Burgundy-Dark Red binder and double linen hinged pages plus protective page edge strips. Comprises 288 strips to position stamps into. Includes a matching leatherette hard slip case to protect the stockbook (black cover version illustrated). Superb Gift! Compass stockbook for stamps, 16 double sided (32 sides in total) black pages with clear strips and frosted protective divider sheets. Comprises 288 strips to position stamps into. Compass stockbook for stamps, 24 double sided (48 sides in total) black pages with clear strips and frosted protective divider sheets. Double Linen hinged pages plus protective page edge strips. Comprises 432 strips to position stamps into. Lighthouse luxury leather effect stamp stockbook, 32 double sided (64 sides in total) black pages and clear strips and double clear divider sheets. Padded dark blue binder and double linen hinged pages plus protective page edge strips. Comprises 576 strips to position stamps into. Includes a matching leatherette hard slip case to protect the stockbook. Superb Gift, UK delivery only. Compass stockbook for stamps, 32 double sided (64 sides in total) black pages with clear strips and frosted protective divider sheets. Double Linen hinged pages plus protective page edge strips. Comprises 576 strips to position stamps into. Compass stockbook for stamps, 8 double sided (16 sides in total) black pages with clear strips and frosted protective divider sheets. Comprises 144 strips to position stamps into. Mint and Used GB Definitive and Commemorative stamps, from Victorian to Modern sets and single. Mint and Used British Commonwealth Definitive and Commemorative stamps, GB Colonial. 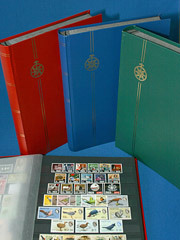 Stock Books for stamp collectors, Philatelist stockbooks, stamp storage books. We can only supply very 'Heavy Items' such as stock-books within the UK.